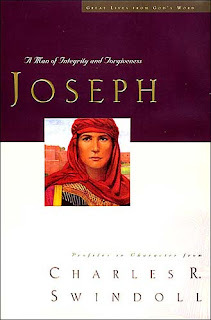 Honestly, Joseph , and these books, are an interesting progression in my spiritual walk. In reading David (: A Man of Passion and Destiny) I felt enthusiastic about the start of this year. I started focusing on the fact that God calls us in different ways and to different jobs. We don't all look the same (thank God Himself!) and I felt I was given freedom to pursue my own spiritual walk. In reading Esther (: A Woman of Strength and Dignity) I was impressed by the fact that God's timing is not my own and His ways aren't my ways. See, these things I may know in my heart of hearts but my head forgets them frequently and needs constant reminders. God isn't asking me to be anyone other than the me He created and He is going to work things out in my life according to His purpose, plan and design. I must continue on in patience. Joseph didn't have an easy life. He was favored by his father and therefore he didn't get along with his brothers. He was, in fact, sold by his brothers into slavery. As a slave, he was falsely accused by his master's wife and thrown into prison, where he lived for two years. Then, one night, the Pharaoh of Egypt had a dream that no one could interpret. Joseph was called out of prison to stand before this powerful ruler and declared that he himself was unable to interpret the dream - but that God could. Joseph is able to minister to the Pharaoh (and the entire country of Egypt) because he had a right relationship with God. However, there were thirteen years between the time that he was first sold as a slave and then was elevated to a place of power and position in Egypt. Thirteen years and Joseph didn't know what God was going to do. He hoped. He prayed. But he didn't know. "I pray because I can't help myself. I pray because I'm helpless. I pray because the need flows out of me all the time- waking and sleeping. It doesn't change God- it changes me." a.) I can choose forgiveness and to work on wounds. b.) God can conquer the sting. c.) I still have to deal with the fact that He works things in His way and in His time. Not my time. His time. I have no way of knowing who is reading my words today or what he or she is going through at this time in life. But I do know this: You are still El Shaddai, the God of unlimited might, boundless power, overwhelming stregnth. No obstacle formed against You can hold You back. No one intimidates You and nothing is too hard for You. Furthermore, since you know the end of the story - Joseph's story, as well as our story - You have the ability to work everything out, so we have no reason to fear. But we're only human. That means we tend to be negative, horizontally focused, and intolerant of new ideas. However, we have come to the place in our lives where we are sick and tired of those tendencies. We need Your El Shaddai strength to help us break those habits and we need Your El Shaddai might to face the future courageously. With Your help, we start today. Give us fresh hope to think positively to trust in Your sovereign control over everything we shall encounter. Calm our fears. Give us fresh courage and a strong confidence in You, Make us contagiously enthusiastic as we begin this new way of thinking and living. Turn our focus from the horizontal to the vertical. Help us to grow old gracefully, saying, "Yes" to life's challenges and "I'm open" to life's changes. I ask this in the all-powerful name of Jesus Christ. Amen." I will have to add this series to by TBR list! I have so many non-fiction books stacked up (which take longer for me to get through), I don't know when I would get to these, but I enjoyed reading your review. I listen to Swindoll a bit on the radio while making dinner, and I can just hear his inflections in the quotes you've listed. My only quibble with "After all, that's the purpose of reading about godly men and women - to break free of those things that have held us hostage and hindered our relationship with Christ and others long enough" is that I'd say it is one reason, not necessarily the reason. Joseph's life is a rebuke in so many ways. I've lived long enough to know by experience that God often uses the difficult things to make us grow and that He can redeem any situation, but I tend to still be grumbly and whiny rather than patient and joyful in difficult times.